Ah, December. A month of extremes, of light and dark, activity and rest. It's always a very busy month for us with many family birthdays, and the build up to Christmas Day is inevitably a slightly chaotic rush of shopping, baking, wrapping, decorating, parties and get togethers. All very fun and all very tiring. I always like the post-Christmas lull the best, that golden week between Christmas and New Year when it's acceptable to loll around in your pyjamas all day, eating turkey sandwiches and doing jigsaws. My December mantel is a restrained affair, largely because all the Christmas stuff is still up in the loft. There is no point putting the tree up this year, as we'll be taking it down again next week, and there's barely room for it anyway what with all the boxes. But I have permitted myself one small space for festive decoration, one calm and quiet area to fill with prettiness. I was thinking about mountains, sunsets, bare trees and frosty mornings when I did this. Some of the best things about Winter. My eBay alpine painting hangs here temporarily, joined by a line of reindeer marching along the top. Do they have reindeer in the Alps? I don't know if they do. Our homemade tea light holders glow nicely. I love these, we light them most days. I have a thing about snowglobes and couldn't resist this polar bear. I am pretty certain that polar bears do not live in Alpine regions. I didn't add the children's stockings this year. They're too red. I know, it's terrible, isn't it? Instead I hung some warm socks. 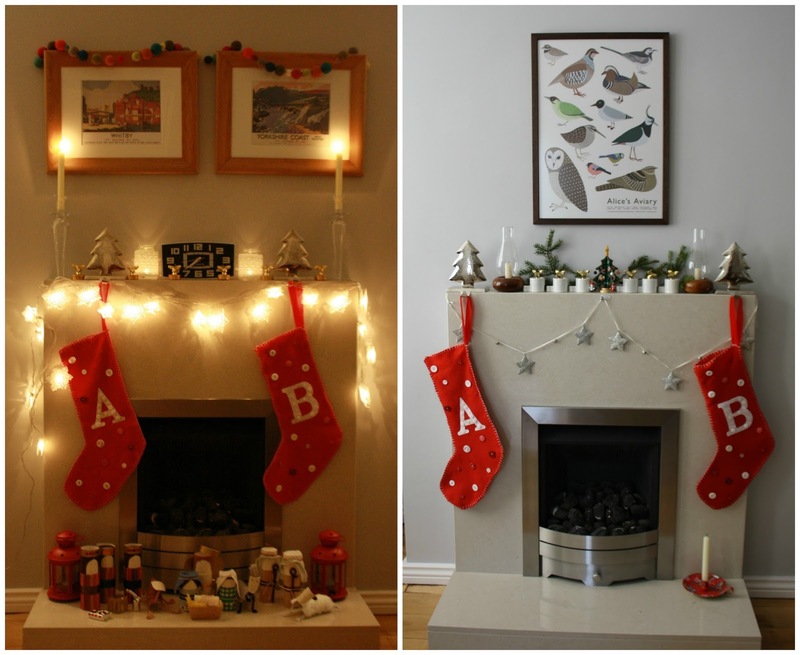 Here is my mantel last year (on the right) and the year before (on the left). Definitely more Christmas-tastic. It's just so nice to have one small area of order amid the disorder! John just said to me "What will you do if there is no mantel in our new house?" Don't worry, I'll make sure that never happens. Oh, how I wish I had a mantel. I have a fireplace without a mantel, just bricks straight up to the ceiling. I'm told this is more "dramatic," but I don't know, a mantel would be really nice. I love your cable cars. I shall think of you every night when I watch the lights on the tram on my mountain as they slowly move up and down in the distance. Oh that looks so lovely and so nice for you to have something peaceful with all your packing going on. I saw the little cable cars too, such a lovely idea to use them as a mantle display. A lovely calm space for you to focus on during your packing. The mantelpiece looks great and I just love those gondolas, especially as they are "pink". I'll pop you an email over the next few days with some catchup. Take care. It's gorgeous Gillian, well done you for finding the time to make a little festive corner. I really like your hanging and the socks together, they're especially snuggly looking. I think your mantel looks fabulous and very festive. I love your mantel, both the reindeer and that beautiful painting. I also find myself wondering how many boxes of christmas decorations you own?? I love your mountain, sunset, bare trees theme!!! The pinks and tans are lovely, and those cable cars are adorable! The Alpine theme really works! And you are right about there being no polar bears in the Alps (and no reindeer, either, but we can pretend they are just normal deer). Never seen a cable car decoration before, but I really like it! Ooooh your mantel is beautiful Gillian! the painting is really glorious and your your tea light holders and cable cars are magnificent too! Lovely! such cute cable cars, too! Your mantel is lovely and I can't believe you have managed to blog about it in the midst of moving. Mine is much more chaotic but I did think of you when I was doing ours and actually put some things away that would normally be on there to make it a different space for Christmas. I have some holly 'tinsel' that has berries the size of cherries and which will probably be a complete fire hazard with the candles. Oh my goodness, there IS a new mantle in the new house isn't there??!! Anyway, the mantle is looking good and most alpine inspired indeed. I love the way the jars tie in with the cable cars so beautifully and the cable cars are so adorable. Love it and I am glad there is one little oasis of calm left! I adore the cable cars! They are fab, how clever! Your mantle is simply lovely. I love how it has changed over the years, I am normally so busy that the same old stuff just gets put up. Love your decorating! Your painting is similar to one I bought in Austria years ago. I love this so much. It has really cheered up my day. Your ebay picture is so fabulous. Oh to have a mantel. This house didn't have a mantle as such, so we invested in an old oak beam and attached it to the wall above the fire. I don't photograph it because that wall doesn't get much light and the walls are painted a queasy cream - a DIY mistake that will be rectified in the spring with a nice coat of white or a very pale grey. It looks gorgeous, good luck on your move I'm sure your new home will be just as fab. Hope you enjoyed your trip to Leeds and thanks for such a lovely blog it is a real treat in my life. We have no mantelpiece. It's awful for a collector/displayer (is that a word?) like me. As soon as we get a new place I'm going mantelpiece crazy and styling it to the nth degree. Good luck with the move. Hope it's all going smoothly. It's cold enough to be wearing those socks! I love those cable cars, so unusual. Your Christmas mantel is beautiful, it has a lovely calm and peaceful feel. Love those cable cars. Beautiful! And so nice to have a small area to rest your eyes in the middle of the boxes etc. Your home looks absolutely lovely! What cool little cable cars! I think I'd have to find a year-round place for those. Good luck with your move. I know well how stressful that can be (I got hives from it once--and I am not a person who ever got hives before or since! ).